We are offering Nylon Chain Coupling. Zero backless torque transmission over all service line/ Low Insercion makes it the Perfect Servo Drive Coupling. 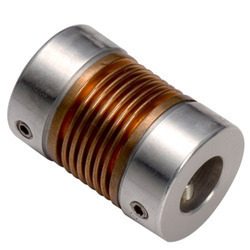 We supply a phenomenal range of Couplings Belly, which is popular amidst our clients because of their sturdiness, accurate dimensions, greater reliability and durability. These bellies are specifically manufactured using optimum grade raw material and advanced techniques by our associated vendors. Metal Bellow Coupling With Inner Conical Hub(KB5 / 18 To 5000). Compact design with high clamping forces.